Rangpur Army Nursing College Admission test circular has been published recently. Rangpur Army Nursing College offers nursing degree to a number of students every year. People who are interested to work in hospitals as nurse can apply for the degree mentioned in Rangpur Army Nursing College Admission test circular. According to RANC Admission Circular 2015 the applicant have to fulfill some requirements which will be mentioned here. So for more news about Rangpur Army Nursing College Admission test circular 2014-15 please keep a sharp eye to our page. Age: Age limit is 17 to 22 by January 1, 2015. Height: At least 4 feet 10 inches. Weight:39.92KG (88 pounds) at least. Chest: 0.66 or 26 inches minimum. Hearing Power: Normal likes other. The candidate must complete HSC or equivalent exam by 2012/2013/2014 and should pass in Biology exam. The candidate must have a total of GPA 6.00 in both SSC and HSC. Any grade less than 2.50 in SSC/HSC will lead the candidate to automatic disqualification. Marital Status: The candidate must be unmarried till the final exam of this course as mentioned in Rangpur Army Nursing College Admission test circular. Photocopy of National certificate attested certificate provided by UP or local Chairman with full address. Attested photocopy of SSC and equivalent transcript. Attested photocopy of HSC transcript and testimonial. Attested photocopy of testimonial of last academic institution. 5 copies recent passport photographs. The applicant should send 300 taka by pay order or drafts to the Principal of RANC in account no: 00070210026624. According to Rangpur Army Nursing College Admission test circular there will be written and viva test to select the candidate. The subjects are Bangla, English, Biology, General Knowledge, Physics and Chemistry. There will be total 100 marks MCQ exam mentioned in RANC Admission Test Circular 2014-15. After passing the written exam the applicant have to face oral viva to confirm the admission. There will be 3% quota for the applicants of freedom fighter’s background and 1% quota for the candidates from tribal area. The authority has all the right to select and reject any one on any ground whatsoever. The last date to submit the application is 8 March 2015. The application should be sent to the address: Principal of Rangpur Army Nursing College, Care of Rangpur Medical College, Rangpur Senanibash, Rangpur. 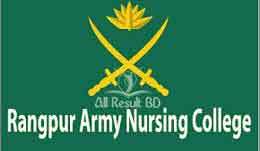 Any application after 8 March will not be granted as mentioned in Rangpur Army Nursing College Admission Circular 2014-15.